Title: It's a Miracle! Or is it? An examination of miracles from Halacha and Hashkafa. Rabbi Adler's Wednesday Women's Chumash and Mishna shiurim are cancelled today, Wednesday, March 13. Rabbi Adler's Monday night Gemara shiur is cancelled on Monday, March 18. Rinat: Rabbi Adler to give Parsha Shiur tonight! Why is kindling of fire singled out amongst the 39 melachot of Shabbat? Parsha Shiur: Tonight, Thursday, February 14, 8:30pm, Yehuda Halpert will speak on: "Who Financed the Bigdei Kehuna? A Multifaceted Approach". Many people have struggled with Gemara learning, either because they never mastered the skills in high school, started learning later in life or just haven't had the right opportunity as adults to try again. The Daf Hashavua program has just started Masechet Megilla. We would like to start a learning group at Rinat -- one daf a week. We can learn, master and make a siyum together on its 31 dapim before Shavuot 2019! The group, which will be led by Rabbi Avi Heller is designed for advanced beginner or intermediate gemara students, although everyone is welcome to join. The focus of the shiur will be on mastering the language and basic flow of the daf and creating review opportunities for better retention. Review shiurim and vocabulary resources will also be posted on OUTorah and bechinot are available for those who want as well. We have not finalized a schedule yet, but would like to meet 2x a week, possibly before or after late ma'ariv. We will start the week of October 26. If you are interested in joining, please email Avi at hellera@ou.org . Reminder: All weekday shiurim are resuming. Women's Chumash shiur at 12:30pm today, studying Sefer Bereishit. Women's Gemara shiur at 8:00pm tonight, studying Masechet Sukkah. Next Monday evening at 8:15pm Gemara shiur studying Masechet Moed Katan. All future shiurim will begin at 8:00pm. As we usher in Chodesh Elul, Rabbi Wiener's three part series for women on teshuva - final class is tonight. Title of the shiur series is: Engaging in Meaningful and Productive Teshuva. Gemara shiur will be on Sunday June 3, at 8:40am. Women’s Chumash shiur - cancelled on Wednesday, June 6. Rabbi Adler's Wednesday evening mishna shiur will take place tonight, Tuesday, May 8 at 8:00pm instead. Please join us for "Seder Surprises” in the Rinat Social Hall. Cong. Shaare Tefillah, Yavneh Academy-YPAA and Cong. 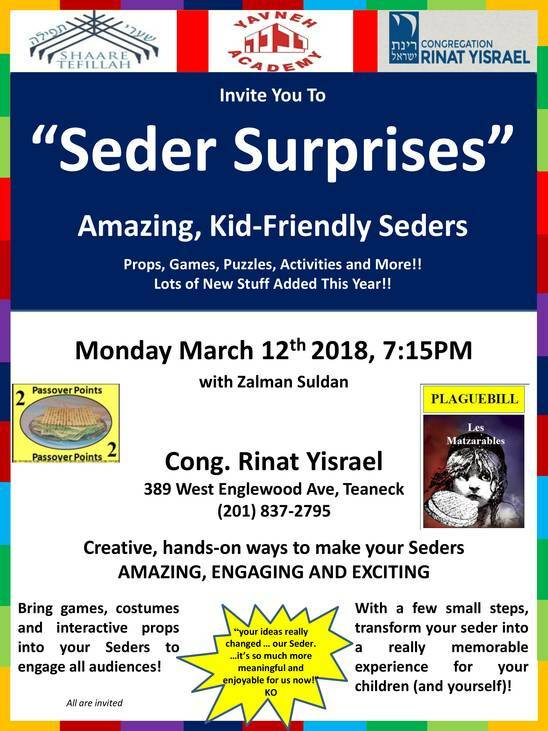 Rinat Yisrael invite the community to: "Seder Surprises" -- Hands-on ways to make your Seders amazing, engaging and exciting! Come for an innovative, multi-media, hands-on workshop. Invigorate your Passover seder with games, props, costumes, etc to engage and excite all ages! 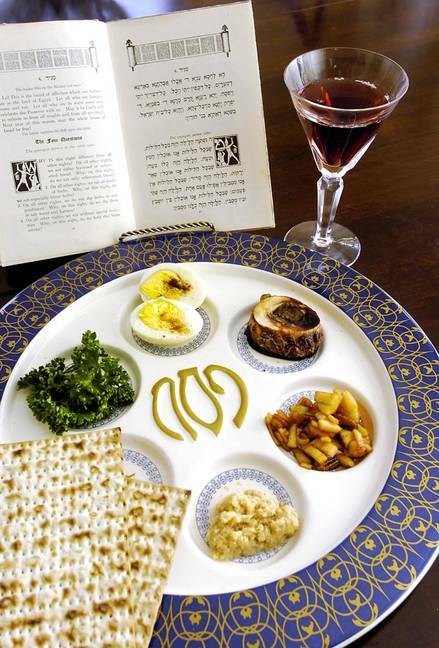 With a few small steps, your Passover seder can be transformed into a really memorable experience for your children (and yourself)! You will never look at leaving Egypt the same way again! Lots of New Stuff Added This Year!! Fourth Annual Community Learning of Congregation Rinat Yisrael and Congregation Beth Sholom, THIS Shabbat, March 17. Joint learning program with Cong Beth Sholom. This year's topic, "Ha-Laylah Ha-Zeh: How the Seder Helped Rebuild Jewish Life After the Destruction of the Temple," addresses Jewish responses to catastrophe and the contribution that the Pesach Seder made to rebuilding Jewish life in the wake of the destruction of the Second Temple. The session will begin at 4:00pm at Congregation Beth Sholom. Please register online at https://cbsteaneck.shulcloud.com/event/bethsholom-rinat-2018 ​​​​​​​. Last chance to sign up! Deadline for sign up is today, Monday, March 12. The Wednesday shiurim will take place as regularly scheduled. Wednesday night: No Women's Mishna shiur due to Purim. Rabbi Adler's Monday night Gemara shiur WILL take place tonight, Monday, February 12, in the Beit Midrash. Sunday, February 11 at 8:00pm, Mrs. Miriam Kosman will be speaking. Mrs. Miriam Kosman, doctoral candidate at Bar Ilan, speaking on "A Jewish Theology on Gender? A Haredi Woman's Perspective". Mrs. Kosman is an international lecturer for Nefesh Yehudi, a program that offers classes on Jewish thought and philosophy to Israeli university students and she lives in Bnai Brak. Her book, Circle, Arrow, Spiral: Exploring Gender in Judaism, published in 2014, explores gender roles in the Jewish community. lecture in commemoration of Martin Luther King Jr. Day featuring Rabbi Saul Berman who will speak on "Selma 1965 : Jewish Lessons from Prison." Rabbi Berman participated in voter registration campaigns and demonstrations in Selma, Alabama during March 1965. Arrested twice, he will share his motivation for that participation and his experiences with both Jews and non-Jews with whom he was incarcerated. Joseph and Sharon Penkower Kaplan in memory of their mothers Gertrude Kaplan and Lillian Stavisky Penkower, z"l, and in honor of Rabbi Saul Berman, y"l.
Rinat: Reminder re Saturday night's film, Fanny's Journey - reserve your tickets today! On Saturday night, January 6, 2018, at 8:30 pm (NOTE NEW TIME), Cong. Rinat Yisrael Adult Education will present the beautiful, award winning film, FANNY'S JOURNEY. The film is an incredible tale of bravery, strength and survival, the true story of a daring young girl who will stop at nothing and fear no one. In 1943, 13-year old Fanny led 10 young children on their own out of France on an impossible journey to safety across the Swiss border and out of the clutches of the Nazi menace. Tickets are $8 in advance by clicking here ​​​​​​​, and $10 at the door. Early purchase is encouraged in order to ensure seating. Watch the trailer by clicking here ​​​​​​​.